There is a large collection of Music 500 and Music 5000 software available for download in the MUS secton of the 8BS download area. 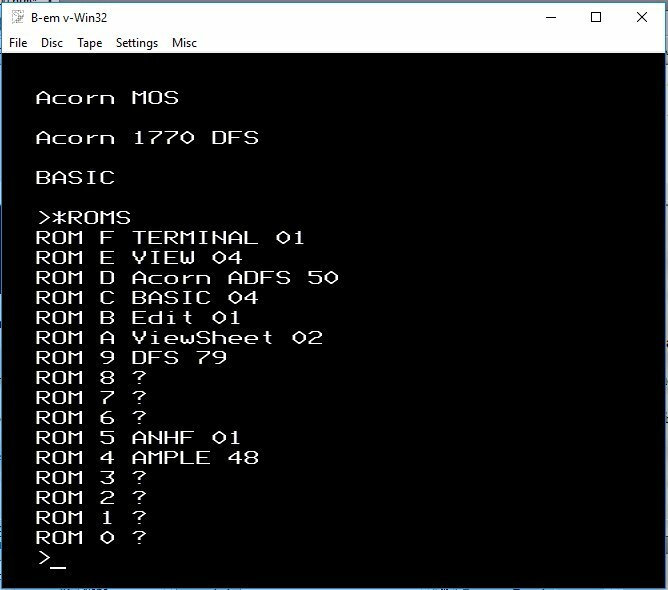 For many years, this remained untested and unsorted by myself until hoglet at Stardot added Music 5000 emulation to B-em the BBC emulator. This is the thread. Here I will describe how to set up and use the stuff available in the MUS section. Firstly, you need to get B-em up and running. 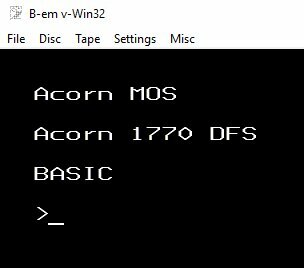 Download MUS-100 which is the copy of B-em that I used. This is not the official or latest version of B-em, for that, you should check out the official B-em page here. Extract the contents of the zip file MUS-100 to somewhere on your PC. You will find everything you need in the folder 'b-em' that is extracted. Within that folder are a couple of folders you need to know about. One is 'Music 500 5000 Manuals' These may be helpful if you wish to delve further into the use of the Music 500/5000. The other folder is named 'discs'. The 'discs' folder contains a lot of useful disc images. The two disc images in this folder that are relevant to the Music 500 and Music 5000 are called 'Music 500.ssd' and Music 5000.ssd'. 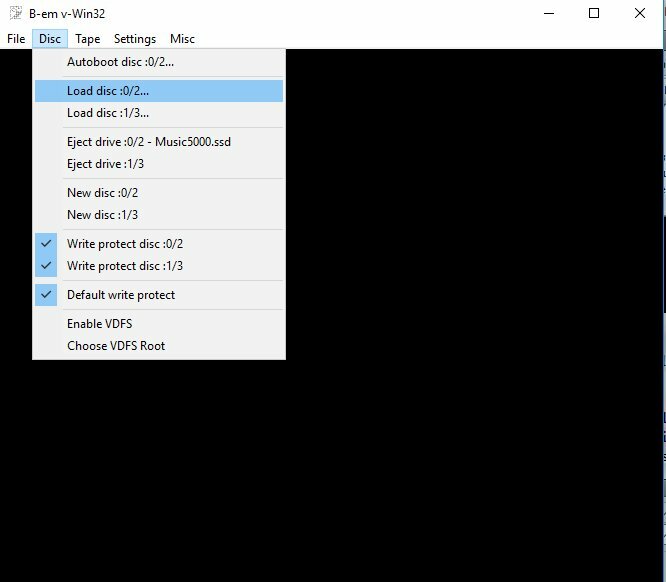 These are the system discs required for the Music 500/5000 emulation. 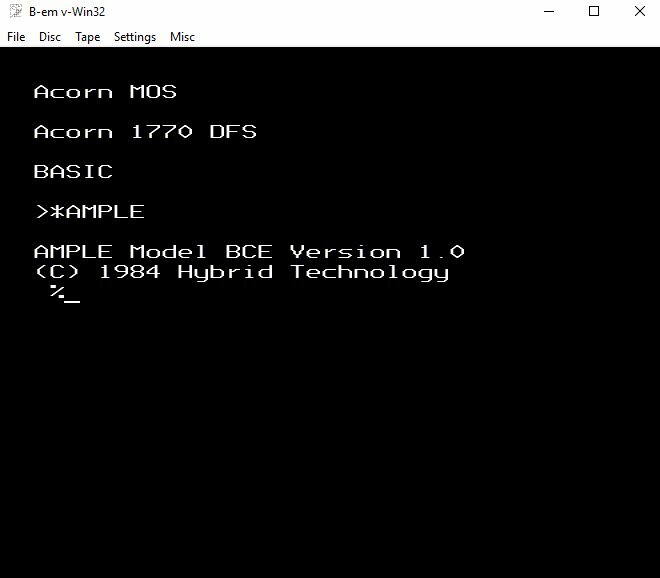 Double click 'B-em.exe' and the emulator will load up. HINT: Your Antivirus software may be alerted by this program. I use Avast, a popup advised me that it was checking the file, after a short time, it assured me all was well. 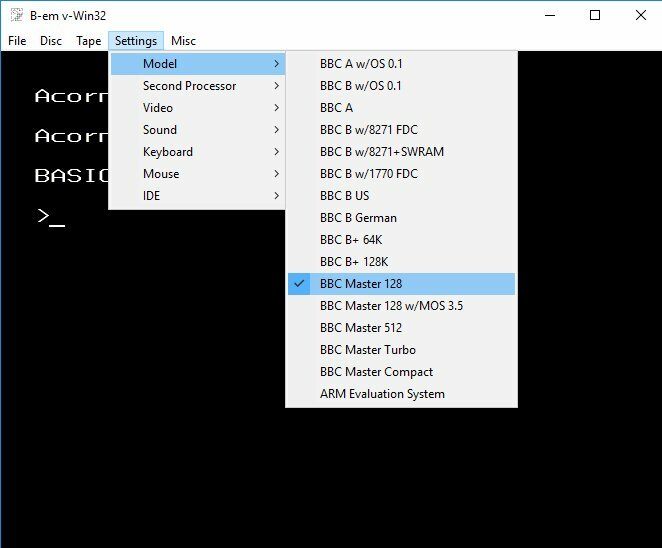 On the 'Settings' tab, click 'Model'and then select 'BBC Master 128'. Then on the 'Settings' tab, select 'Sound' and then 'Music 5000'. 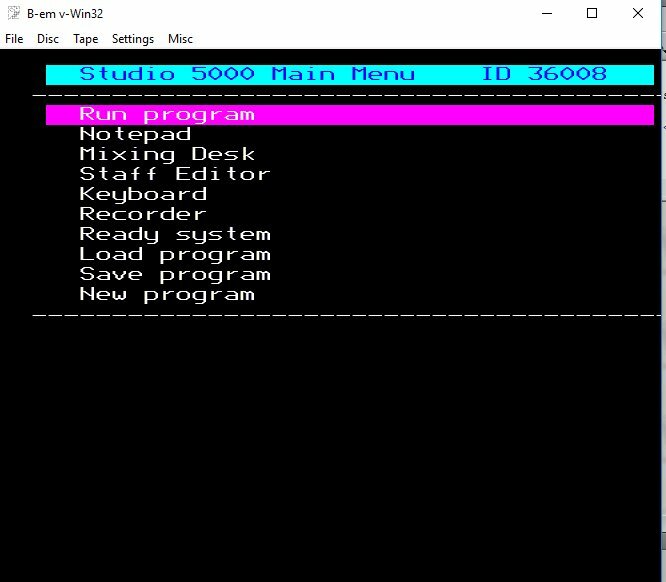 On the 'Disc' tab in B-em, select 'Load disc :0/2...' and browse to the folder (discs) holding 'Music 5000.ssd' and select it. 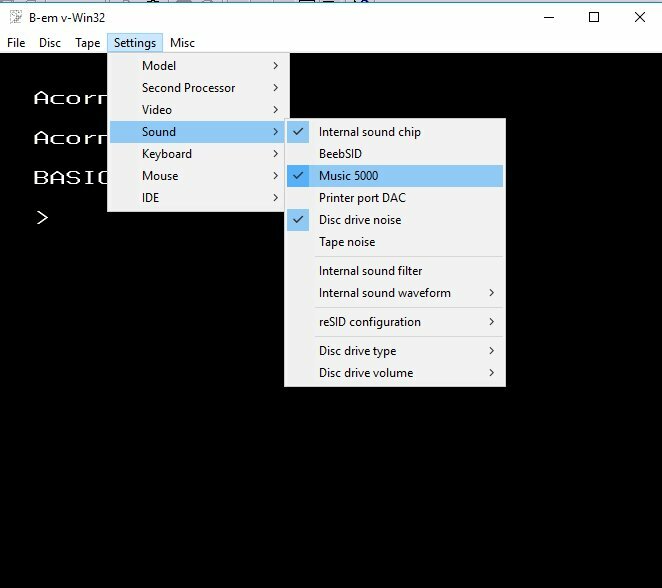 You can check what discs are currently loaded in to the emulator by doing this. The disc currently in drive 0 is ejectable, logically, that means it is in there! Typing '*.' 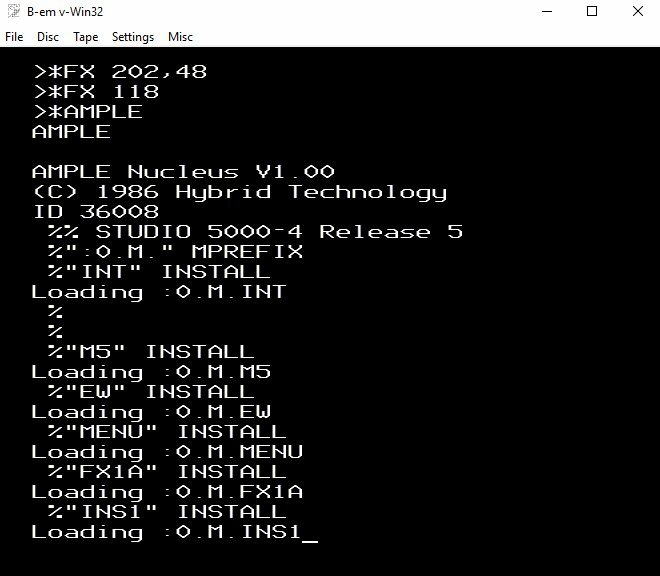 into the emulator will also show the files on the disc that is loaded. HINT: The PC default equivalent for the '*' key is the '@' key. 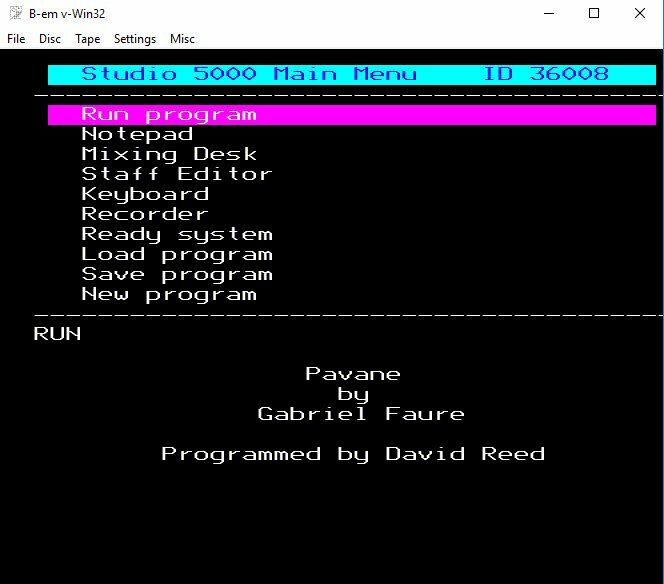 This is what the Music 5000 system disc looks like after typing *. 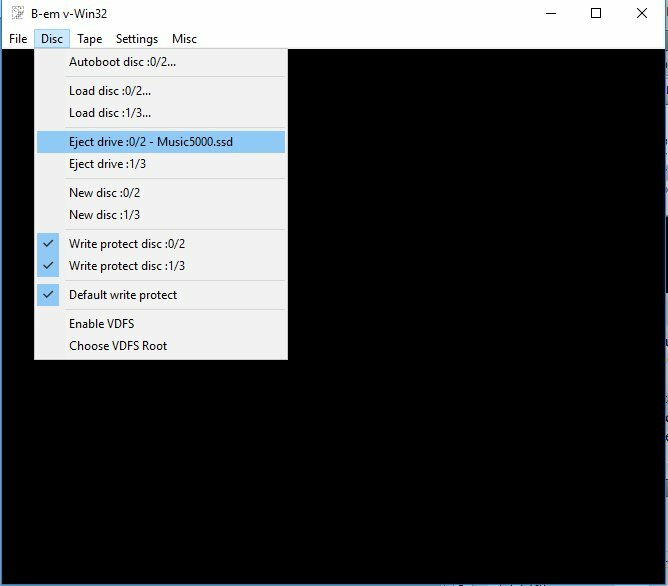 To speed matters up now, you could change the speed of the emulator to maximum, this won't help if you are trying to type into the emulator but it will help if you are waiting for the disc to perform it's stuff. 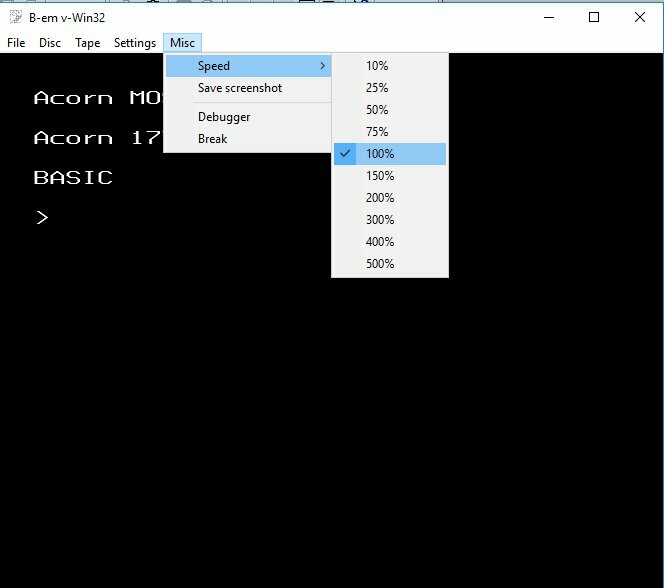 To change the speed of the emulator, click on 'Misc' and then 'Speed' and select the speed you currently want. If you are going to type into the emulator, select 100%. Hold the 'SHIFT' key and quickly tap 'F12' whilst holding 'SHIFT'. This tells the BBC to boot up the disc. HINT: To shorten the whole procedure, you can simply do 'CTRL'+'SHIFT'+'D'+'F12'. This puts the BBC into DFS and boots the disc in drive 0 all in one swift go. The instructions up to this point are good for any disc image you may load in to the emulator. After this point, the instructions here are specifically for the Music 5000 disc image and emulation. After booting up the Music 5000 disc with 'SHIFT'+'F12', the disc drive works for a while and the screen clears. 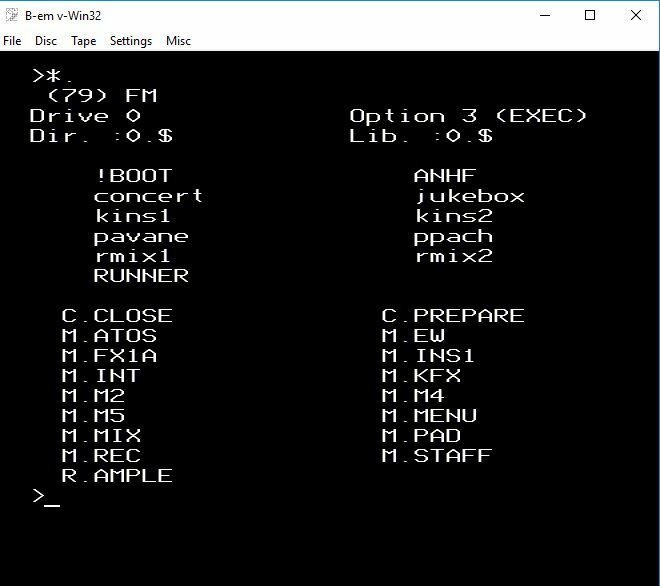 Typing '*ROMS' will show that the two AMPLE ROMs (ANHF and AMPLE) are loaded and ready in slots 4 and 5. 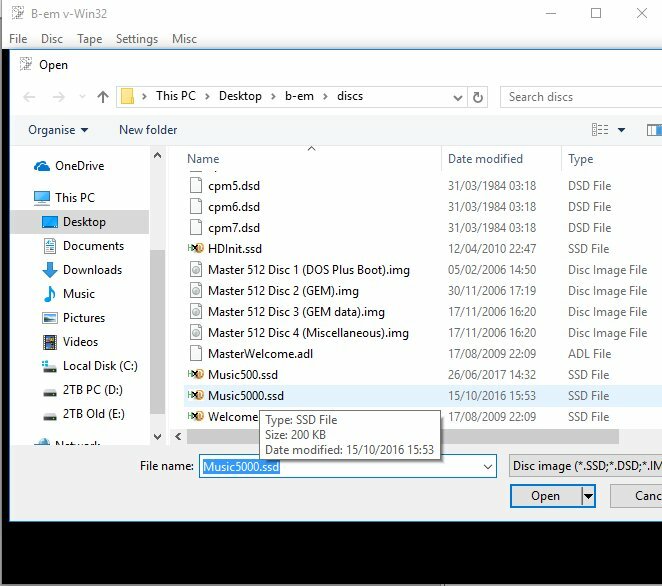 At this point, you can put a disc containing Music 5000 music files into Drive 0 by clicking on the 'Disc' tab and browsing to a disc image. There are three ways to run a music file that I am going to describe here. I shall use as an example a music file (PAVANE) already stored on the system disc, there is therefore no need to change the current disc image. METHOD 1. 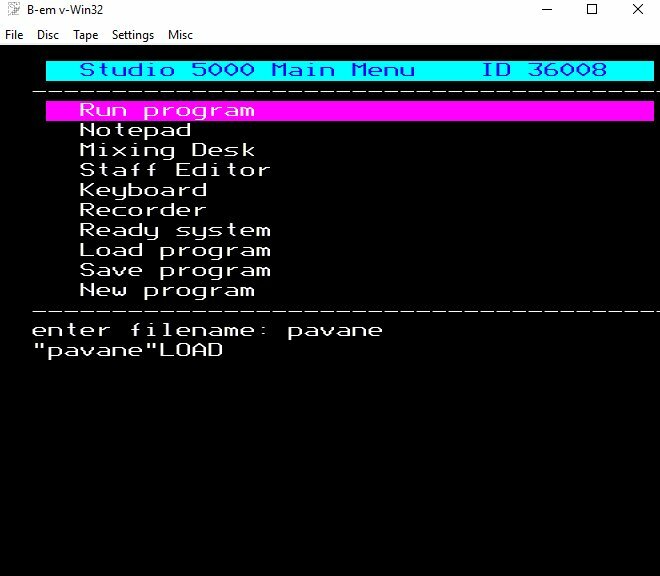 Use the system menu shown in the screenshot. Use the arrow keys to move the bar up and down to select 'Load Program'. Type the filename of the tune you wish to load 'pavane' and press 'ENTER' (BBC equivalent of 'RETURN'). 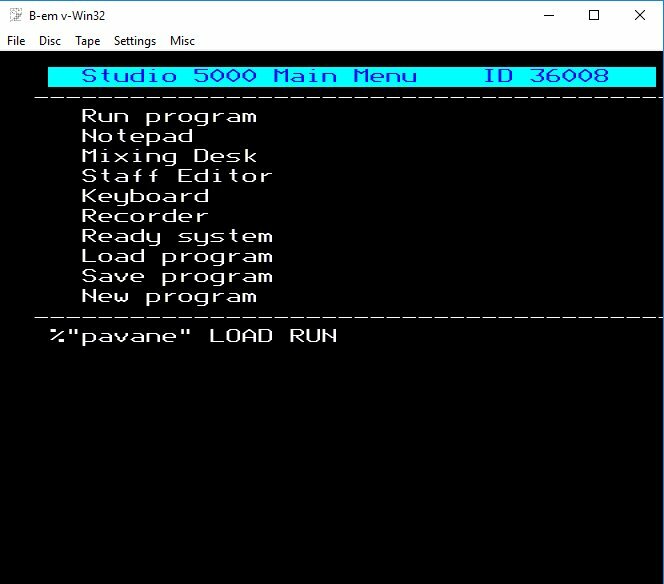 Use the arrow keys to select 'Run program' (the program defaults to this so there is probably no need to move the bar). To use this method, you must know the filename of the tune. That is where the full description of all of the files in the 8BS MUS section will come in useful as I have listed all of the relevant information. Press 'ENTER'. The following should then show and a tune will play. IMPORTANT, ensure you type the commands LOAD and RUN in uppercase or the BBC will not recognise the command. The music and information should then run as in method 1. You can type 'LOADRUN' (no spaces) too. Load the Music 500 system disc in to drive 0. Do SHIFT+F12 to boot the Music 500 system.